This year many US GAAP filers, especially in the banking industry, are focused on the new accounting challenges coming their way from the Federal Accounting Standards Board’s (FASB’s) revolutionary prescriptions on Current Expected Credit Loss (CECL). Beginning after December 2019, for SEC registrants (and later on for others) CECL will impose an unprecedented requirement on all respondents to maintain life-of-instrument estimates of credit losses (ECL) on financial assets, both performing and non-performing. Under the new rules, every quarter respondents will have to defend such estimates as being “reasonable and supportable” as far forward as they care to make them for specific assets and pools of assets, before reverting to plausible statistical histories for the remaining tenors of these assets. Although banks and others may be well-accustomed to conducting internally-directed predictive analyses of some sorts on their financial assets any such analysis falls far short of the formal, explicit, comprehensive and recurring representations to both auditors and regulators that CECL will compel. Solving for all of CECL’s prescriptions will be a profound exercise in enterprise risk management for a great many financial institutions. They will likely craft their responses from both internal and a variety of external resources. RapidRatings brings superlative credentials to one of CECL’s most critical challenges – making tenable, consistent and continual financial health judgments about corporate borrowers at scale. For many respondents with longer-term assets, especially banks, FASB’s new ECL exercises will have to begin with “reasonable and supportable” calculations of Term PDs for internal workflows and for delivery, in turn, to auditors and others. But, as the BIS recently cautioned, such PDs must be “point-in-time” (PIT) and not “through-the-cycle,” so that many banks will need to adjust their longstanding Basel-based metrics accordingly. Outside the US, the International Accounting Standard imposed its own credit-impairment standard on January 1, 2018 – IFRS 9. Here the ECL-calculation interval will extend only to 12 months, except for the deteriorated asset on which the respondent will have to make a CECL-style expected-loss calculation over the instrument’s lifetime. Global banks will become dual reporters, filing under both IFRS 9 and CECL. Many of them int end to adapt their IFRS 9 tools and processes to their subsequent CECL needs. RapidRatings uses a combination of advanced analytics and proprietary algorithms to provide accurate financial health assessments of public and private companies for clients, which include several G-SIBs, along with other financial institutions and a number of the largest non-financial companies in the US. In order to help our clients meet their pressing CECL and IFRS-9 obligations, RapidRatings has developed an algebraic Term Probability of Default (PD) Model with a forecast horizon of up to ten years. The new Term PD Model, a PIT system with a range of portfolio-support services surrounding it, is designed to serve as an authoritative primary model to meet both CECL’s analytical needs and its reporting obligations to auditors and others. For those banks that have other systems in place, the RapidRatings Term PD Model can serve as a rigorously independent challenger model to better achieve these new goals. What is most important is that the model and its underlying analytics, described below, are deliberately free of size bias, so that the model will serve equally well in grading Small Business, Middle Market and Large Corporate C&I borrowers. The Core Health Score (CHS) combines 62 financial ratios in an econometric model that differentiates exceptionally well between weak and strong firms in assessing efficiency and competitiveness over the next 2-3 years. It runs on a scale of 0/worst to 100/best. The Financial Health Rating (FHR®) is composed of the CHS and its interactions with 11 additional Resilience Indicators in a probabilistic statistical classification model that produces an estimate of the Probability of Default over 12 months. The Core Health Score explains 88% of the default-prediction accuracy level achieved by the FHR Model, while the 11 Resilience Indicators are the source of the remaining 12%. The FHR likewise runs on a scale of 0/worst to 100/best. RapidRatings refreshes these Core Health Scores and Financial Health Ratings on public companies of all descriptions around the globe, as often as they report. We apply the same metrics and industry-specific weightings to private companies that we rate confidentially for individual subscribers. Since our rating exercises are entirely automated, they can be applied readily on any scale a subscriber may require. In order to assure complete objectivity in its work, RapidRatings takes no rating fees or management guidance from any company in coverage. Establishing the Term PD Model’s classification accuracy in sorting between defaulters and survivors involved the careful examination of the 3,458 firms in the Markit 3000 for which RapidRatings had issued an FHR in calendar 2006 (mostly based on financial information for the year ended 12/31/2005). The exercise can be illustrated by grouping companies according to four FHR cut-offs 2 — 25, 40, 60 and 90. The percentage figures in Table 1 outline the performance through calendar 2007, 2008, etc. The row for FHR under 40, for example, displays the cumulative default experience of companies rated below 40 in 2006. In turn, we assessed the Model against multiple criteria of robustness and predictive value over the course of these same years. One of the main conclusions in the Model was that poor corporate financial health persists for a long period of time: groups with lower FHRs in 2006 were always more likely to default, even seven years later. Figure 1 reveals the strength of the selected Term PD Model. It compares the Model-predicted (shown by the 45-degree dotted line) and the observed default rates over horizons of 2 years, 3 years, 5 years, and 10 years. The estimated probability is close to the observed probability over the whole range for which the observed probabilities are accurate enough for meaningful comparison (there are very few firms with less than a 1% probability of default over 5 years and virtually none over 10 years). The probability of default increases smoothly as the time horizon lengthens, for every value of FHR. 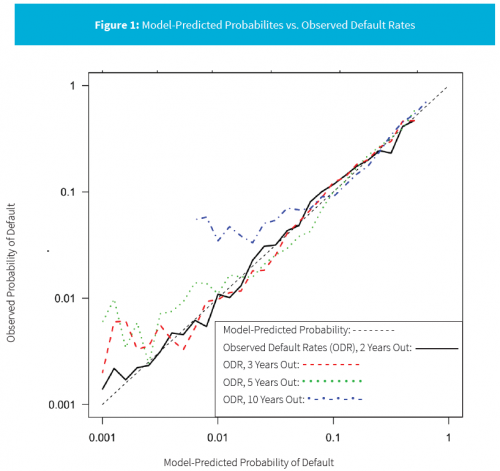 The probability of default declines smoothly as FHR increases, at every time horizon. The classification accuracy declines gradually at longer horizons, but remains high out to 10 years. The expected probability of default matches the observed default rates for all FHRs out to 10 years (with the possible exception that the expected probability may be too low for the highest-rated firms for horizons over 5 year). In addition to serving banks struggling to meet CECL’s demands, RapidRatings also expects its present subscribers in third-party risk management (TPRM), corporate-credit extension and capital markets to put the new Term PD Model to immediate use. It will tell them if and when to begin their mitigation-planning on counterparties and if and when the financial marketplace properly reflects a focus company’s longer-term prospects versus those of its competitors. Since our data-ingestion, ratings-generation and archiving workflows are entirely automated we can address TPRM and bondportfolio surveillance needs on any scale and frequency necessary, as with bank loans. A whitepaper is available that details the development and application of the RapidRatings Term PD Model. Our firm stands ready to afford present and prospective subscribers further insights into this analysis, while also looking forward to discussing their discrete requirements for service delivery. Download the full whitepaper as a PDF.